There are 13 species of Darwin's finches found in the Galapagos Islands, which are famous for their evolutionary history. Darwin’s finches, named after Charles Darwin, are small land birds, 13 of which are endemic to the Galapagos Islands. 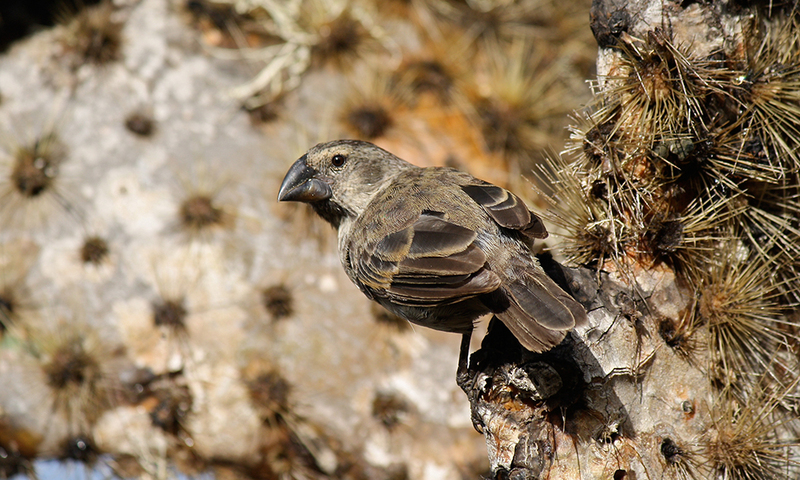 The 14th finch is the Cocos finch which is found on Cocos island, Costa Rica. They are not actually true finches – they belong to the tanager family. It is thought that their ancestor, and closest known relative, is the dull-coloured grassquit, which is found on mainland South America. 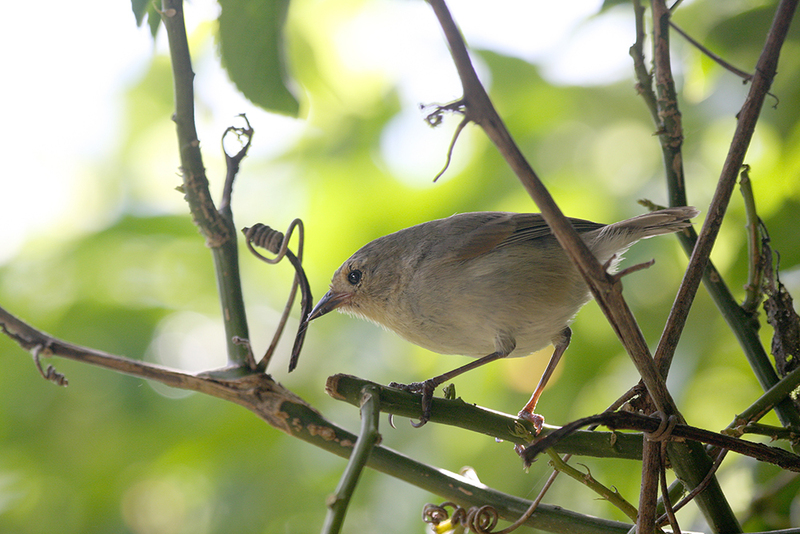 Once the original grassquits arrived at Galapagos, they diversified and adapted to the different environments found on the Islands, eventually becoming different species. They famously evolved to have different beaks which are suited to different food types such as large seeds and invertebrates, allowing them to occupy different niches. Darwin’s finches are all very similar in shape, size and colour, but there are a few differences which can help when identifying them. These include diet, habitat, and beak size and shape. You can find out more about identifying Darwin’s finches in our blog here. Green warbler finch (Certhidea olivacea). Vulnerable. Until 2008, it was thought that this was the same species as the grey warbler finch. Grey warbler finch (Certhidea fusca). Least Concern. These finches are found mostly on smaller, drier islands. Mangrove finch (Geospiza heliobates). Critically Endangered. These rare finches are only found in a small area on Isabela. Woodpecker finch (Geospiza pallida). Vulnerable. This finch is well-known for its use of tools. It can use a twig, stick or cactus spine to dislodge invertebrates from trees. Large tree finch (Geospiza psittacula). Vulnerable. This species has a large, powerful bill with a thick base and is found on a number of the islands. Medium tree finch (Geospiza pauper). Critically Endangered. 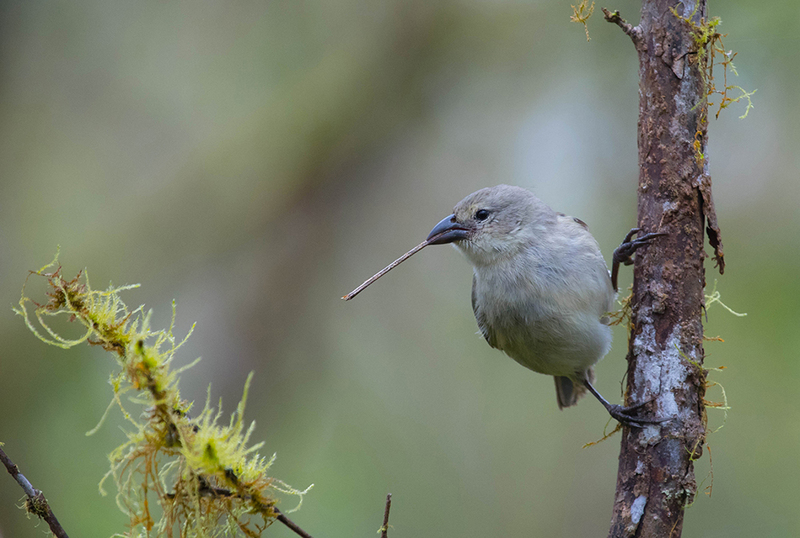 This finch is only found in the highlands of Floreana. Small tree finch (Geospiza parvula). Least Concern. These finches are small and have distinctive short, curved beaks which they use to mostly feed on insects. Large ground finch (Geospiza magnirostris). Least Concern. The largest of Darwin’s finches both in size and beak size. They have large, short beaks for cracking large seeds and nuts. Medium ground finch (Geospiza fortis). Least Concern. These finches are found on a number of the islands and feed mainly on seeds. Small ground finch (Geospiza fuliginosa). Least Concern. One of the most common species of finch, found throughout the Islands. Large cactus finch (Geospiza conirostris). Least Concern. This finch is one of the most variable of the finches in appearance and they feed on a range of foods including Opuntia cacti. Common cactus finch (Geospiza scandens). Least Concern. As their name suggests, they feed mostly on Opuntia cacti. When the Opuntia are in flower, the finches feed almost exclusively on pollen and nectar. During other times of the year, they will feed on Opuntia seeds and fruit. They will also feed on a range of other vegetative foods and invertebrates. Sharp-beaked ground finch (Geospiza difficilis). Least Concern. 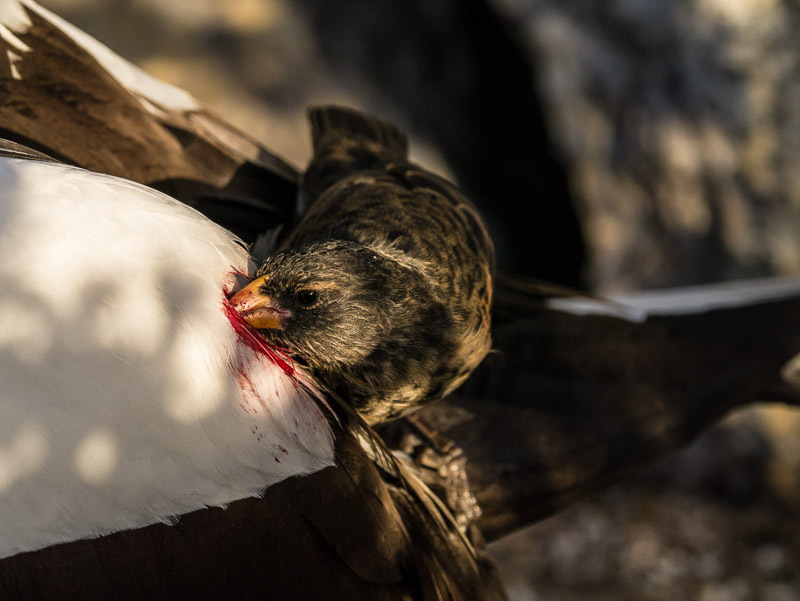 Although most populations feed mainly on seeds, those finches found on the small and remote islands of Wolf and Darwin often drink the blood of large seabirds, such as boobies. This has given them an alternative name – vampire finch. Where to see them: Different finches can be seen on different islands. 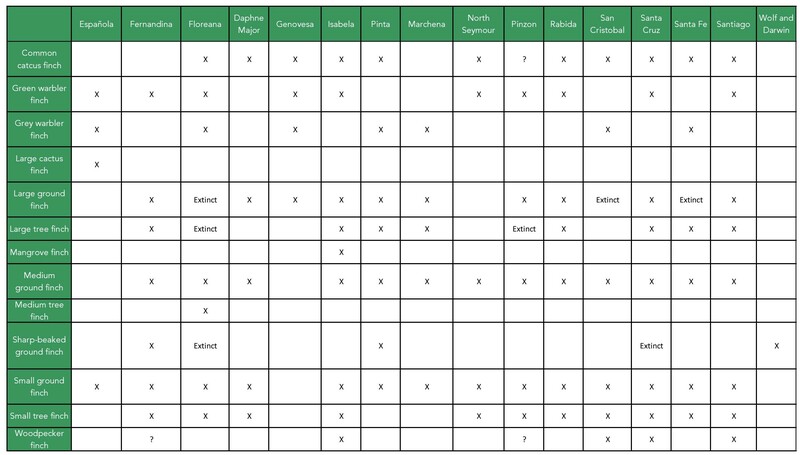 You can see more in this table. 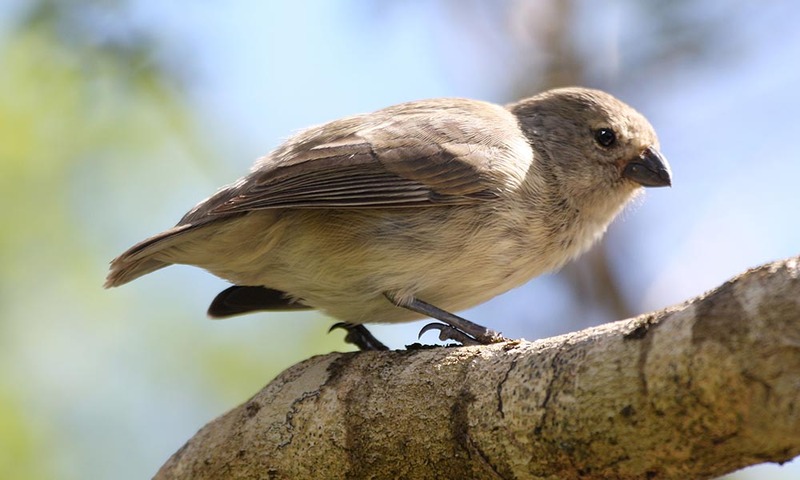 Threats: Darwin’s finches are under threat from a range of issues including introduced predators and diseases, habitat destruction and the invasive parasitic fly Philornis downsi. 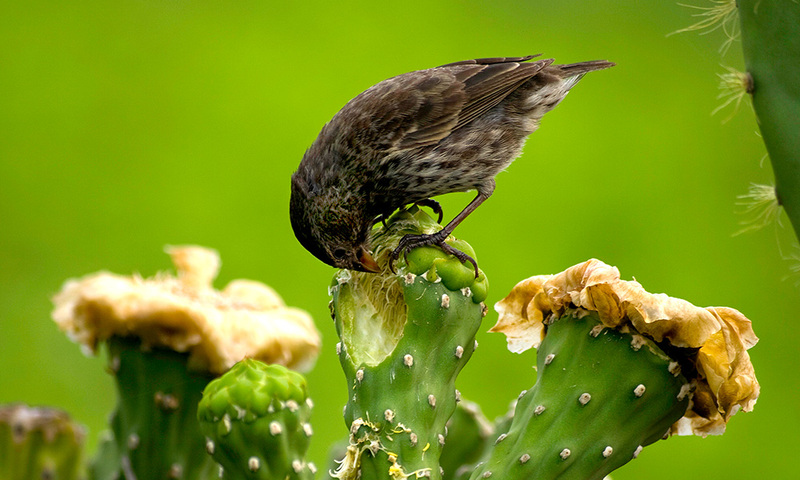 Conservation actions: A number of projects occurring in Galapagos will benefit Darwin’s finches. On Floreana, GCT is supporting one of the largest conservation efforts of its kind ever attempted on an island with a human population which will attempt to eradicate invasive predators and directly help the finches found on the island. There is ongoing research into reducing the effects of Philornis downsi on finches, and GCT support a specific project focussed on protecting the mangrove finch.